529 gets broadened, the pro and con. Named after a section of the tax code, 529 college savings plans have been a revolutionary tool in the struggle to pay for higher education, which for decades has risen in cost much faster than the U.S. rate of inflation. 529s enable you to contribute an unlimited amount of after-tax dollars. 529s grow tax-free and withdrawals are also tax free, if used to pay for books, tuition, room and board. The Tax Cuts and Jobs Act extended the 529's reach, so starting in 2018 you can use a 529 to pay for private pre-college education, K-12. Religious, military, gifted, and other specialized primary and high schools are, thus, more affordable. Keep in mind, paying for a child's education earlier could hurt savings for college. College and graduate schools generally cost much more than K-12 at a private school. Be clear on a 529's limits. What if you don't use all the 529's proceeds? There are many ways to pay for college: financial aid and parents' pitching in, a student taking a side job to support paying tuition, etc. If a balance remains in the 529 account, you're generally paying for expenses other than education — like a down payment on a first home, is not permitted. If you use the proceeds for anything other than education, you pay a 10% penalty and income tax on the earnings segment of the withdrawal. A better idea: channel the money to a relative for schooling purposes. When to tap a 529. And what if the 529 isn't enough to pay for an entire four years of college? Do you use the account at the beginning or end of a college career? If you opt for the first two years, you forfeit two years of growth at the outset. Statistically, odds favor the account growing more after taxes if you defer withdrawals. How to use a popular tax credit. The American Opportunity Tax Credit provides a maximum annual credit of $2,500, and it is unavailable for singles with adjusted gross income of more than $90,000 per year, or couples with more than $180,000. Either the student or another taxpayer who declares the student as a dependent can take this credit. A caveat: You only can take the credit for four consecutive years and the academic and calendar years don't line up, unless you start in January and graduate in December, four years later. That may mean, for students who follow the traditional college schedule, only three years are available: combining the last half of freshman year, sophomore and junior years, then the first half of senior year. The dependent question. Parents can claim education credits for a student dependent, if the student receives over half of his or her support from mom and dad. The student can't earn more than $4,000 annually. Bottom line. 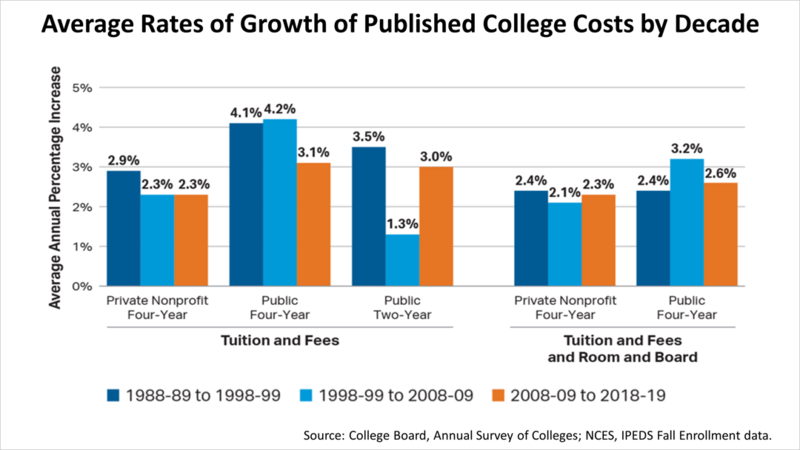 According to College Board, a not for profit founded in 1900 to expand access to higher education, college-the cost of college rose 2.3% annually for private colleges and 2.6% for public colleges in the decade ended with the 2018-19 academic year. Private colleges are more expensive, costing an average $34,740 for the 2017-18 school year, and public colleges came in at $9,970. The bottom line is that it is wise for families — parents, grandparents and children — to articulate the choices and plan a comprehensive long-term strategic solution to this serious financial challenge. This article was written by a professional financial journalist for Sovereign International Pension Services and is not intended as legal or investment advice.